On the eve of his U.S. homecoming, jazz tenor saxophone legend Dexter Gordon played Japan for the first time, sounding majestic and fluent. Tenor Saxophonist Dexter Gordon was a large figure in jazz—a legend as well as a player. Six feet and six inches tall, he towered over others players—as an early bop player in the 1940s, he influenced players who would later emerge such as John Coltrane and Sonny Rollins, and he later became a vigorous, rich-voiced exponent of mainstream post-bop jazz. His early 1960s Blue Note albums were instant classics, then he became an itinerant American ex-patriot living in Europe, finally having a celebrated homecoming in 1976 that led to a late-career resurgence—including an Oscar nomination for "Best Actor" for his appearance in Round Midnight, playing a somewhat tragic jazz musician based loosely on Bud Powell and Lester Young. In addition, Gordon was a heroin addict who spent years in jail during the 1950s, losing his cabaret card, then re-emerging in dramatic fashion with a new style under his belt. He was arguably the Dave Chappelle of mid-century jazz—beloved and often missing. For all that lore, Gordon's music never got lost, though it was probably colored by his reputation. In addition to the superb playing in several styles, Gordon played with a very accessible boldness. He had a rich tone and a penchant for quoting popular tunes amidst his improvisation, quick to throw "Mona Lisa" or a popular aria or a bit of soundtrack music into the flow of his solos. Like Rollins, he enjoyed playing dramatic cadenzas at the end of his performances, with pregnant pauses, intimate and breathy tones, and then flurries of excitement. By the time Gordon played his first Japanese concert, memorialized in Tokyo 1975, which this recording makes available for the first time, his style was set and wholly formed. He was traveling with the best of the ex-pat rhythm sections he had assembled in Amsterdam: Kenny Drew on piano, Neils-Henning Orsted Pederson on bass, and Tootie Heath's drums. The result is a brief concert (under an hour) that presents the band flying, emoting, and playing to the crowd with all the tools that hard bop could offer. The opener, a Gordon original called "Fried Bananas" that he often played during this period has a hooky melody and set of chord changes that allow Gordon to motor, all cylinders firing. What you hear in his solo is vintage stuff and a great preview of what would make his American "homecoming" recordings so popular at a time (the mid-1970s) when straight-ahead, acoustic jazz seemed to have lost steam. Gordon carves out big slabs of free-wheeling melody that happens to be spontaneous: all logical runs, blues licks interspersed with hard bop turns, small climaxes that build into larger ones over time. Drew's solo is buried in the mix here—with Pederson's bass out front as was the fashion in recording at the time—but he sounds thrilling as well. Best of all is when Gordon trades fours with Heath at the end, each man like a boxer, throwing uppercuts and hooks to the thrill of the crowd. But it's also classic Gordon that, at one point, Heath goes silent for one of his breaks. It's a stunt, perhaps, but hoo-boy, the crowd eats it for lunch. The band takes "Days of Wine and Roses" at an aggressive stroll, with Heath chattering with a somewhat Afro-Cuban groove and Pederson and Drew each involved directly in the conversation. When Gordon solos, the bass moves into a 4/4 walk, and the tune essentially becomes another medium-tempo opportunity for the leader to unleash his fluid ideas, chorus after chorus. This is the Gordon who played a thousand different rooms in a thousand different towns, owning each one because his playing was so swinging and compelling. Pederson rivals him on his solo here, playing double-time runs that are so precise and hip that he seems, himself, like a saxophonist. It is the strongest performance of the show. The ballad on the program is "Misty", lush and controlled. Gordon had all his wind and all his maturity in 1975, and he can do more with one note—shaken slightly, bent, breathy vibrato added for sensual emphasis—than seems possible. Rollins' debt to Gordon makes sense as you listen to this, as the horn has a husky sensitivity to it, brusk or ragged in tone... but then gorgeous at the same time. Indeed, on the unaccompanied cadenza at the end, Gordon quotes "How are Things in Glocca Morra" twice, a favorite tune of Rollins', and you can hear the influence flowing back the other way. Drew's best solo is here, with Pederson telepathic in anticipating lovely harmonic moments with every note voiced for glittering transparency. The set then ends on a crowd pleaser that harkens back to Gordon's time with Billy Eckstine's band in the 1940s, a vocal rendition of "Jelly, Jelly, Jelly". Gordon sounds pretty great doing what is essentially an Eckstine imitation, and the rhythm section rocks the tune with a strong backbeat. The crowd whoops through the whole thing, and Gordon puts on a show that's surely all too easy for him, quoting Nat Adderley's "The Work Song" for a long stretch, for example. Underneath Drew's solo, the bass and the piano's left-hand lock into a rock 'n' roll bass line for a long stretch, demonstrating how close jazz could be to, say, jump music of Louis Jordon or the early rock of Little Richard. Is this kind of thing "beneath" a band as good as this one? Your call. Tokyo 1975 then tacks on two more performances from elsewhere. Thelonious Monk's "Rhythm-A-Ning" was recorded with Drew and Pederson two years earlier, with better and more muted fidelity: Pederson sounds less like a buzzing, metal bassist and Drew is present in the mix rather than fighting to get through from the back. Gordon, too, sounds more natural and less shoved up on the microphone, and the sense that this was a band of equals comes through, though it's still the leader who builds a solo with the most momentum and logic. He plays a long solo, never boring, and then Drew matches it, all understatement and rippling right-hand runs. Finally, we get a wonderful 1977 recording from New Haven, after Gordon has returned to the U.S. and has been playing for a year with the rhythm section he fronted at the Village Vanguard (and trumpeter Woody Shaw) upon his return. In classic Gordon form, he starts things by reciting from the song's lyric, and then he launches into "Old Folks", with Ronnie Matthews' piano rolling beautifully strummed/arpeggiated chords behind the master. Stafford James' bass, after all of that busy Pederson playing, comes off as a pleasing relief (if less awe-inspiring), and Louis Hayes on drums is a slow-developing wonder. Matthews' solo may be more impressive than Gordon's—a great blend of modern jazz and tradition, and when James starts walking beneath him at about 7:30 in, you get a sense of what a pleasure it must have been for the great saxophonist—after all those years in Europe and playing with jazz musicians who were not quite the top—to be in the public eye with a band that could push him and blend with him in equal measure. Having seen Gordon play around this time, I can say from experience that there was a feeling of royalty about these performances. The "young lions" who would come along to revive this kind of acoustic jazz in the 1980s hadn't quite arrived yet, and many of the best jazz players were engaged in either breaking new ground in lofts or nontraditional commercial venues, often engaging with rock and funk. Those were bracing, worthy passions, but for a year or so it was Gordon's returning-hero traditionalism that seemed like the music's best connection back to an era that we didn't want to end. Today, of course, there are a couple of dozen tenor saxophonists in New York alone who seem capable of channeling Gordon's majestic sound and command. 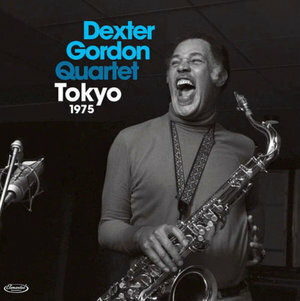 He isn't cited as a major influence all that frequently, perhaps, but listening to these generous, open-hearted performances, you certainly get the sense that Dexter Gordon is still a big part of the reason why this kind of mainstream jazz knows how to stir the soul.